"Why I not like anybody else? I wanna be." There's an old show business saying that goes something along the lines of "I'm an actor but what I really want to do is direct." Most times when big name stars go from taking direction to giving it, quite often the end results can be more painful than a root canal. However, there have been notable exceptions: Clint Eastwood, Gene Kelly and Charlie Chaplin to name a few; artists that took their creativity to a new level while enriching audiences in the process. Diane Keaton is another performer that has had impressive turns behind the lens. Although her résumé is a small one, it's filled with a wide assortment of eclectic and commercial projects: the 1987 documentary Heaven, episodes of China Beach and Twin Peaks, Walter Matthau's swan song Hanging Up and even a Belinda Carlisle music video (Heaven Is A Place On Earth). 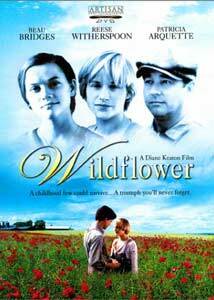 Wildflower, a 1991 TV movie Keaton helmed for the Lifetime cable network, may be her finest effort. Based on the Sara Flanigan novel Alice, the story is set in the Depression-era South, initially focusing on Ellie and Sammy Perkins (Reese Witherspoon, William McNamara), a tight-knit brother and sister. Brought closer together by the death of their mother, their bond enables them to deal with their bitter, grieving father Jack (Beau Bridges), who keeps them on a very short leash, which is particularly frustrating to Sammy as he has dreams of going to college and becoming a writer. One afternoon while riding her horse through the woods, Ellie hears the plaintive wails of what sounds like a wild animal. Curious and anxious to help, she discovers a dirty teenage girl named Alice (Patricia Arquette), locked inside a shed. Frightened at first, she returns to offer aid in the form of candy and, more importantly, compassion. On subsequent visits accompanied by Sammy, they discover that Alice is deaf and epileptic, the latter being a very misunderstood condition way back when, which in turn explains the savage beatings at the hands of her heartless stepfather Ormand (Norman Max Guthrie). Steadfast in devotion to their new friend, the tenderhearted siblings offer a safe haven from violence, teach her to read, recruit the town�s family doctor to offer medical help and most touching of all, manage to break down the hard exterior of their father who's touched by the deaf girl's situation. Yet complications arise as Alice begins to fall for Sammy, creating a dilemma: Should he stay at home and explore this newfound love or follow his literary dreams made possible by a well deserved scholarship? Although it threatens to get a bit hokey at times, there's a sincere sweetness to Wildflower I found very endearing and touching. There's another saying in Hollywood that casting is key, and I don't think that this movie would have been as effective without the contributions of a great ensemble, particularly Witherspoon and Arquette. Showing range beyond their years at this particular point in their careers, it is no surprise that they both went on to star in even better films, including Election, Flirting With Disaster, Pleasantville and Ed Wood. Diane Keaton's contribution behind the camera cannot be underestimated; she evidently learned a lot from working with the likes of Allen, Beatty and Coppola. Together with Janusz Kaminski's feature-film caliber photography, she achieves a period feel that is beyond authentic and super impressive for a television-based production. Image Transfer Review: Had to admit, the fuzzy opening credits had me worried but once they cleared, a very warm transfer presented itself for the duration; above average for a television movie. Though a tad too soft, the reproduction of the film's crisp photography more than suffices. Audio Transfer Review: Since the film is mainly dialogue- based, this very basic stereo track only calls attention to itself during Kenny Edwards and Jon Gilutin's scoring passages. Extras Review: None here to speak of, but oh, to have had a commentary track by the notoriously shy Ms. Keaton. I'm sure her recollections on working with the likes of Bridges, Arquette and Witherspoon would have proved very fascinating. One of the best television movies of the 1990s, Wildflower serves as a great showcase for two of Hollywood's best young actresses (Witherspoon, Arquette) and a well done directorial outing for Diane Keaton.